This is a fun alternative to having a pinata. The treats are inside the balloons! Because I don't trust the kids with pointy darts yet, we had a stomp/sit popping event. However, you could also try it using throwing darts or a thumb tack on the end of a dowel rod. 1. Cut board or box to the size you want. 2. Insert candy into some of the balloons. I found it easiest to hold open and then slide the candy in. Blow up balloons. I used candy for the filler since the boys were going to sit on the balloons. However, if you were going to use darts or the thumb tack to pop the balloons, small toys or gift cards could also work! 3. Attach balloons to the board/wood. I used a staple around the edges and Duct Tape for the balloons the stapler wouldn't reach. 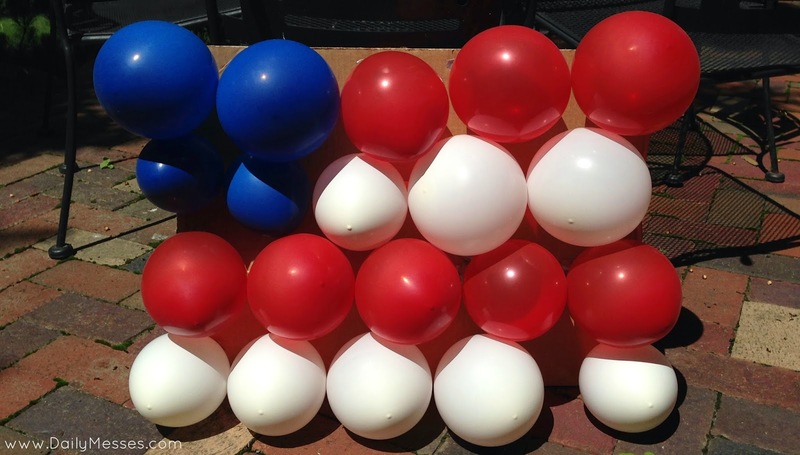 Because it's so close to the 4th of July, I arranged the balloons in a flag pattern. 4. Pop the balloons and find the treats!